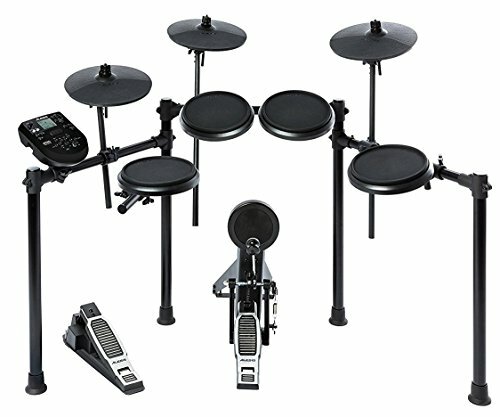 As a drummer who spent many years on both acoustic and electronic drum kits, I’ve been pleasantly surprised at the Alesis Nitro Kit. I honestly expected a kit in this price range to be garbage, but it has exceeded my expectations by a long shot. It’s obviously not as fully featured as high end sets, but this is a great option if you’re on a tight budget. Alesis is a manufacturer that is really gaining popularity in the industry at the moment for their full electronic drum sets. 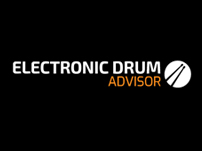 They are making electronic drumming more affordable and accessible to a wider range of people. The Alesis Nitro kit is a follow-on from the DM6 model. The Nitro has now become one of the most popular electronic drum sets that you can buy online. Let’s start by talking about the features of this kit. Note: Newer Version Available. The Alesis Nitro Mesh Kit. The Alesis Nitro Mesh set shares most of the features and elements with the Nitro kit, expect with updated mesh drum heads. These elements provide a more dynamic and realistic drumming feel than rubber pads. Upgraded version of the Alesis Nitro kit - with all mesh heads. The Alesis Nitro consists of eight drumming elements. For starters, this set includes a snare drum with a dual zone that will effectively respond to your drumming. It provides with a nicely genuine drumming feel. You can count on three 8” tom pads with special dynamic features. As for the cymbal set, there are three 10-inch cymbals featured in the Alesis Nitro kit. In addition to the hi-hat and the ride cymbal, you get a stroke-enriched crash cymbal in this kit. Also, you don’t have to worry that your kick drum will fall down and damage during the concert. It’s supported by a stark pad tower. Since knowledgeable drummers know that the kit holders are also important for the sound quality, it’s important to stress out that this set includes four aluminum posts. Hence, this mounting rack will keep your drums safe and sound (especially sound) during your gigs. The fact that they’re aluminum makes them light for carrying to gigs and concerts. The Alesis Nitro kit comes with the drumsticks of fair quality. After all, you can use them for practice and rehearsals and get another pair of sticks for your gigs. All the aforementioned pads have rubber covers. This is soft, responsive rubber that gives an authentic drumming feel. 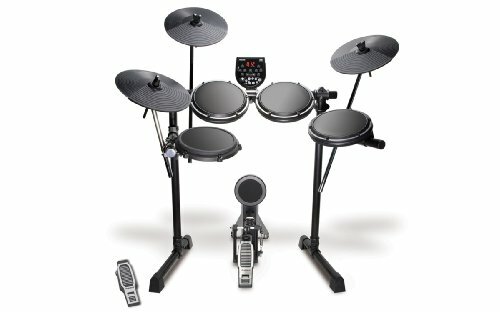 It’s a pretty quiet electronic drum set, so there are no unwanted side-sounds when you’re playing the Alesis Nitro kit. You can also add drum pads from other manufacturers to this kit. But please check the specifications of the other components to ensure they are compatible. 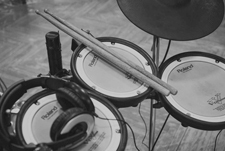 One of the crucial advantages of electronic drum kits is the option to record your own drumming patterns and sounds. This set contains 385 different generic sounds, all packed in the Alesis Nitro drum module. Moreover, you can use a wide range of preset modern and traditional drum kits. You can also try seven different hi-hat combos and spice up your hi-hat fills and breaks. The manufacturers didn’t forget the beginners. They included 60 play-along tracks for drumming beginners and those who haven’t played for a while to improve their skills. Also, you can adjust these tracks to your playing level. 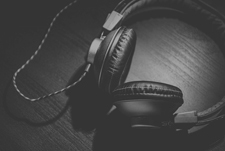 That way, you can change the tempo, click track and the volume to your current needs. The key isn’t adjustable, though. As for the effects, the Alesis Nitro brings the reverb effect and a 3-band equalizer. As an electronic drum set, you can plug it into any stereo device. Also, when you want to isolate from your surroundings, just can just plug in a set of headphones. Please bear in mind that this set doesn’t come with headphones, so you should also buy a set of these. You can connect this set to your computer and play with its options. It’s compatible with Windows 7 and later versions, as well as with Mac OS X 10.7 and later. I was actually surprised at how decent the sound quality as in this set. 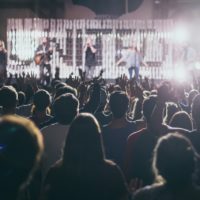 Obviously, you’re not going to get the incredible acoustic simulation that you would find in top end electronic drum sets (which can cost thousands of dollars!). However, the sound quality is very good for the money you’re paying. 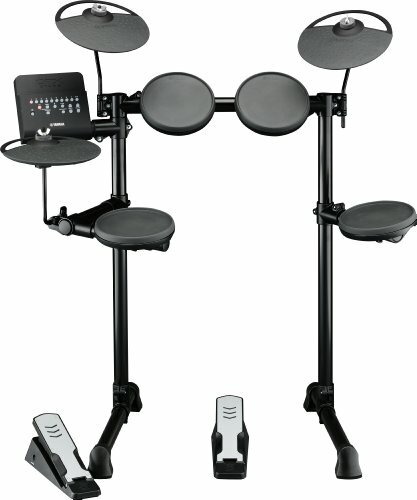 Durable hardware: The pads are nicely responsive and they last longer than many pads in this price-range of electronic drums. Snare features: You can make decent rim shots on the snare. Also, both the snare drum and the crash cymbal come with multi-zone sensors. 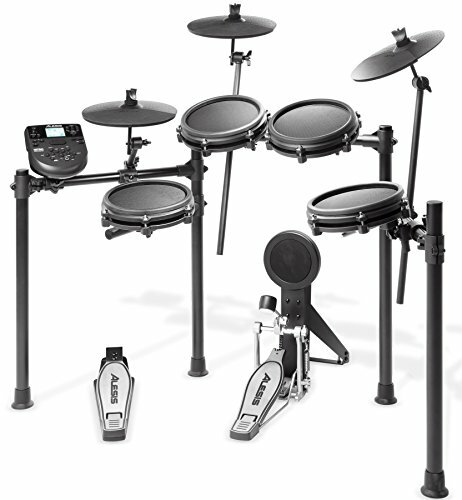 Expandable components: The Alesis Nitro set is expandable with additional crash and tom drums. This isn’t a common feature for this class of electronic drums. The abundance of sounds: The number of 285 different sounds really add to the popularity of this kit. 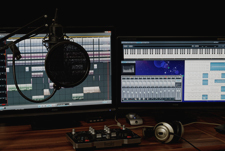 They enable you to create some custom kits, which is a great perk for music authors. 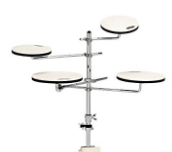 Adjustability of the rack– While you can adjust its position, the mounting rack still feels a bit too low, especially if you’re a taller drummer with longer hands. The solution is to raise the rack by putting something beneath it. Single zone ride cymbal pad– The Alesis Nitro ride is a single-zone cymbal. Therefore, the players who like the ride bell won’t be able to get this sound here. This kit uses all rubber heads, you will hear some tapping but it’s actually reasonably quiet. The part that has the most potential for noise will be the kick pedal. As mentioned in our main e-drum guide, a rug below your kit might be a good idea to absorb some of the sound if noise might be a concern. Of course, you can plug a set of headphones into this kit, so only the drummer will hear the triggered sounds. If you want to get a lot of volume out of this kit, then consider buying a drum amplifier. It works very nicely in conjunction with these. If you happen to have a keyboard amp, that might also suffice. How easy is this set to store away? Most of the pieces of the Alesis Nitro are attached to a single rack, with the exception of the kick pad, tower, and hi-hat pedal. It’s quite easy to store away or transport if required. 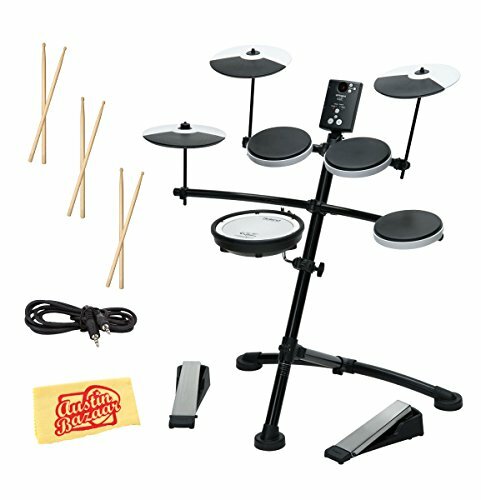 Can I use a double-pedal with this kit? 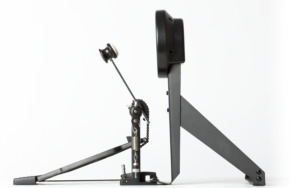 The kick tower is not specifically designed to work with a double pedal. If you can adjust the beaters of your pedal to be close enough together then it might actually fit. You may also need to adjust the sensitivity of the kick pad. 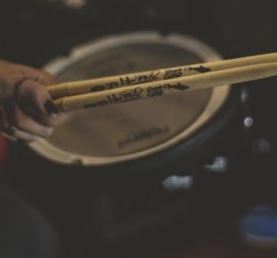 If double bass drumming is really your thing, then you can always upgrade your kick pad later on. 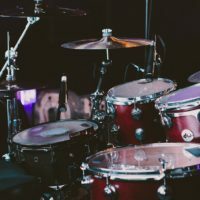 Check out my article on double bass drumming for electronic drum kits for more information. Is this kit suitable for kids? As mentioned in my guide for kids drum sets, the general rule of thumb is over seven years of age for comfortable playing. It’s best to use your own judgement on that. If you search online you will see plenty of videos of kids playing amazingly on full sized acoustic drum sets! 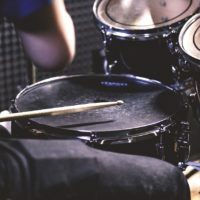 The main thing to keep in mind is that your kid should be able to reach the foot pedals, while also being able to hit the drum pads and cymbals. 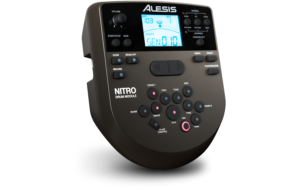 This price range where the Alesis Nitro belongs can’t cover all the bases when it comes to first-class playing. However, this set is a great choice for amateur and intermediate drummers. Also, it will satisfy the needs of professional drummers on a budget as their practice electronic drum kit. To cut a long story short, it’s a great value for money and you can rest assured that the Alesis Nitro kit is a fantastic drumming companion. Do you have any questions on this Alesis Nitro electronic drum set review? Be sure to ask it below, and I will get back to you as soon as possible. Hi Sean, we haven’t gotten a chance to review the nitro mesh kit yet unfortunately, but I’ve heard that the mesh heads are quite similar to the mid-range Alesis mesh heads, except that the nitro mesh ones are quite a bit smaller. A bit of speculation… but based on that, they still should be pretty decent. However, I really don’t think they’d be that comparable to the likes of the more expensive Roland mesh heads, but it would likely still be an upgrade compared to rubber heads. Apologies I can’t give a more comprehensive answer yet!